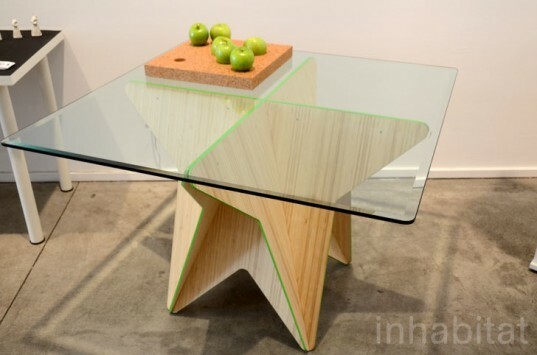 For the past three years Model Citizens has drawn together a remarkable range of cleverly conceived, socially conscious, and environmentally sustainable furnishings and products during New York Design Week - and this year's exhibit was the strongest showing yet! 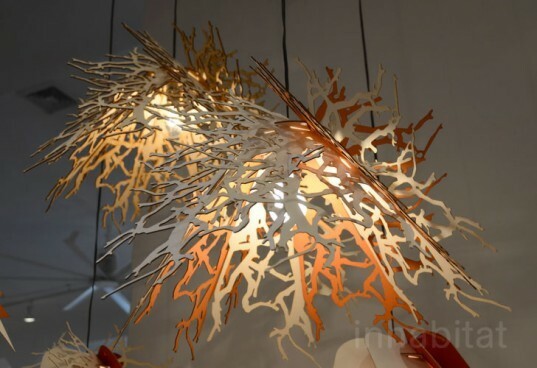 The event drew together over 90 independent and emerging designers to showcase stellar lighting solutions, innovative recycled furniture, and gorgeous eco jewelry - read on for our favorite green finds! Esin Arsan showcased a clever set of coffee mugs that serve up a reminder about the world’s vanishing endangered species with every cup of joe. Each animal’s imprint is rendered in an unglazed section that is stained and slowly revealed as the cup is drank. Colleen Jordan‘s wearable planters brighten your wardrobe with a miniature pot that can be strung around your neck. The cute porcelain charms are just the right size for housing a single flower, sprout, or succulent. Fabbrica Da Ponte‘s brilliant bags are made of materials salvaged from vintage bags and textiles from the past century. Each one of a kind satchel is made by hand in Brooklyn using reclaimed and repurposed materials. Perhacs Studio showcased a new line of modular pendant lights that are laser cut from cardboard and other low-impact materials. Each lamp is assembled without screws or glue from 8 “leaves” that can be interchanged to form an incredible variety of shapes. 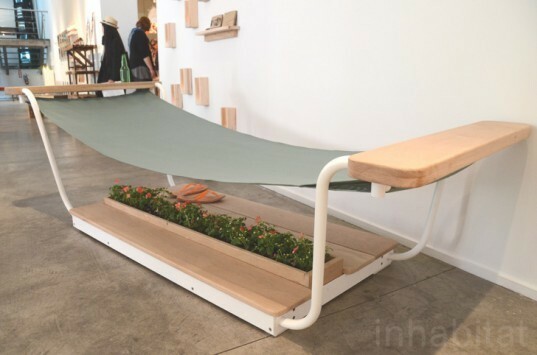 Plywood Office unveiled “Hammy”, a breezy hammock that is suspended above an integrated wood platform with a flower planter. We can’t imagine a more relaxing chaise for a warm sunny day! 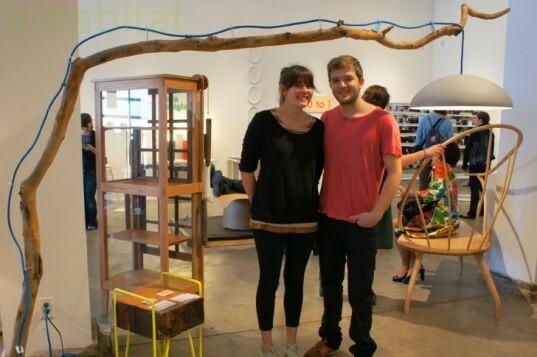 We were thrilled to see Vancouver-based Organelle Design showcase one of their “Hangeliers” made from repurposed clothes hangers at Model Citizens. Each intricate chandelier is made from wood hangers, bike rims, chain rings, and zip ties. Click Boom Pow‘s funky recycled 2nd Life collection breathes a new life into cast-off chairs and other furnishings. 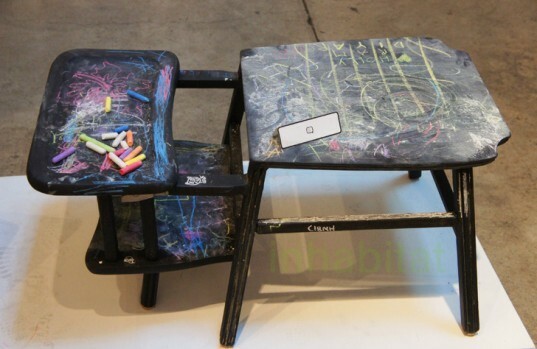 This clever chalkboard coffee table has been repurposed from a child’s high chair. Frances Ranno unveiled an innovative transforming coffee table that goes the extra mile by extending outwards to offer more space. A bright pop of color at one end distinguishes the elegant design. Tamara Petrovic showcased a striking flat-pack table that can be cut from a single sheet of bamboo. Perched atop the table is “Fruit Play”, a plane of cork that flattens out the common conception of a fruit bowl. 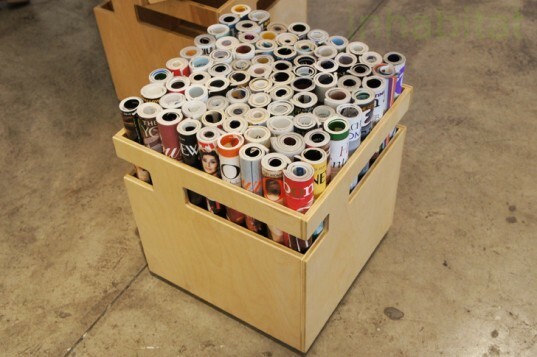 Organelle Design also unveiled a smart storage element that serves as a stool when it is filled with rolled up magazines. Designing Hope‘s Rebuild Blocks are limited-edition toys created with the Happy Hearts Fund to raise money for the construction of a kindergarten in Indonesia. Each block is handmade from reclaimed mahogany and poplar, and all proceeds from the sale of each set go to support the school. 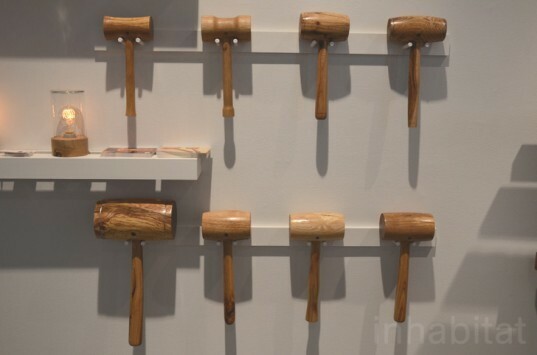 Blight Design transformed a naturally fallen Pennsylvania oak tree into a series of turned wooden mallets for his friends who work as chefs. Reclaiming Brooklyn designer Harris Hine showcased an arching floor lamp made from a found tree branch that beautifully merges rustic and modern design elements. 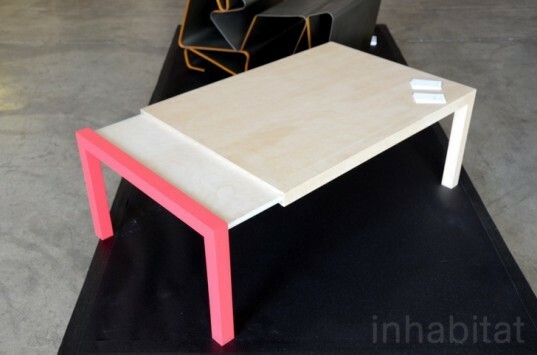 Reclaiming Brooklyn also exhibited a stool made from salvaged wood that pops atop a brightly colored metal frame. Build it Green NYC worked women in the ReNew program to design and build a set of furniture made of wood salvaged from NYC water towers. Ashley Jean Landon salvages off-cuts from wood shops and transforms them into miniature trees! Her Reforestation “forest” is a response to the tremendous amount of waste in the lumber industry. Brooklyn-based Paper No. 9 creates beautiful vegan bags with a leather-like aesthetic by treating sheets of common cardboard with oils and heat to make them soft and supple. The result is a velvety texture that wears well and only become more beautiful with age. + More Model Citizens Photos on Flickr! I bow down humbly in the presence of such gearntses. Esin Arsan showcased a clever set of coffee mugs that serve up a reminder about the world's vanishing endangered species with every cup of joe. 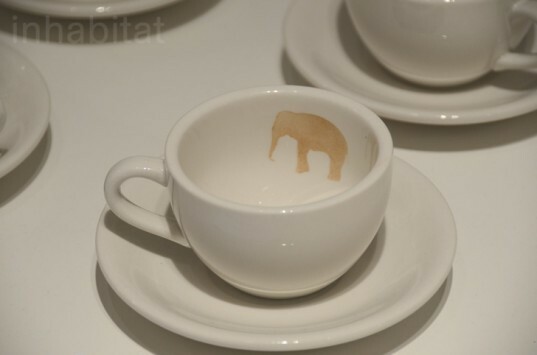 Each animal's imprint is rendered in an unglazed section that is stained and slowly revealed as the cup is drank. 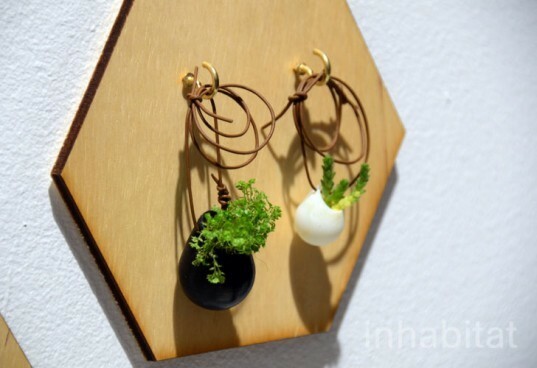 Colleen Jordan's wearable planters brighten your wardrobe with a miniature pot that can be strung around your neck. The cute porcelain charms are just the right size for housing a single flower, sprout, or succulent. 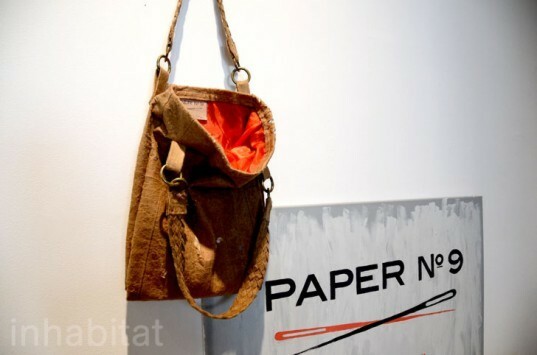 Fabbrica Da Ponte's brilliant bags are made of materials salvaged from vintage bags and textiles from the past century. 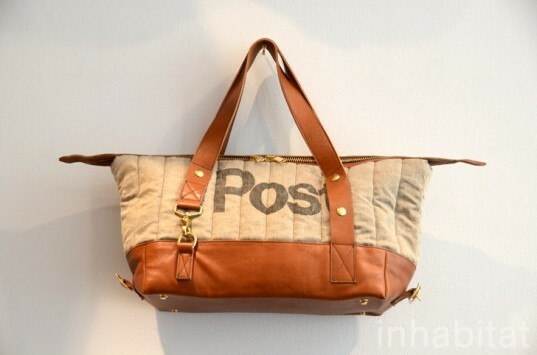 Each one of a kind satchel is made by hand in Brooklyn using reclaimed and repurposed materials. 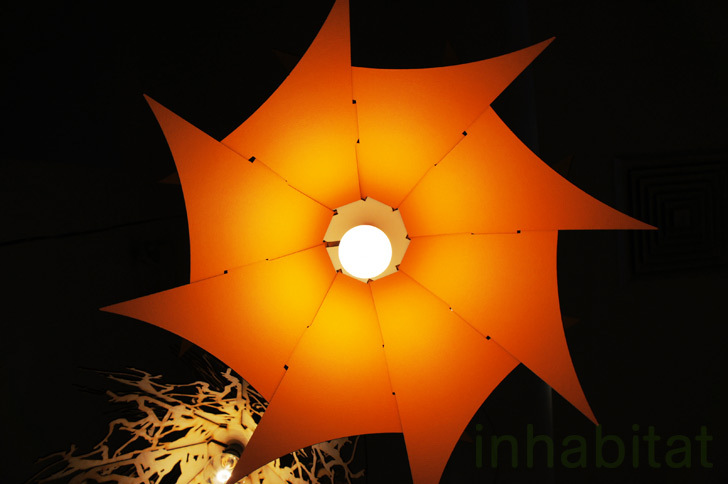 Perhacs Studio showcased a new line of modular pendant lights laser-cut from cardboard and other low-impact materials. Each lamp is assembled without screws or glue from 8 "leaves" that can be interchanged to form an incredible variety of shapes. Plywood Office unveiled "Hammy", a breezy hammock that is suspended above an integrated wood platform with a flower planter. We can't imagine a more relaxing chaise for a warm sunny day! We were thrilled to see Vancouver-based Organelle Design showcase one of their "Hangeliers" made from repurposed clothes hangers at Model Citizens. 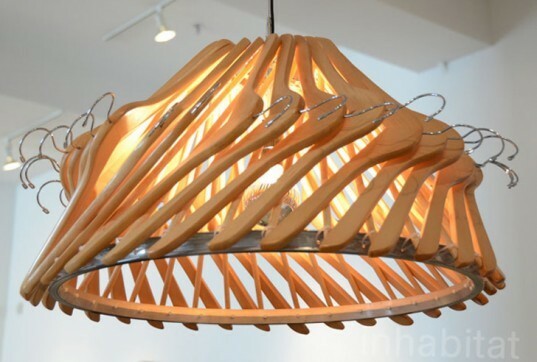 Each intricate chandelier is made from wood hangers, bike rims, chain rings, and zip ties. Click Boom Pow's funky recycled 2nd Life collection breathes a new life into cast-off chairs and other furnishings. This clever chalkboard coffee table has been repurposed from a child's high chair. This comfy bench made from two salvaged dining chairs is another piece in Click Boom Pow's 2nd Life colleciton. Tamara Petrovic showcased a striking flat-pack table that can be cut from a single sheet of bamboo. Perched atop the table is "Fruit Play", a plane of cork that flattens out the common conception of a fruit bowl. 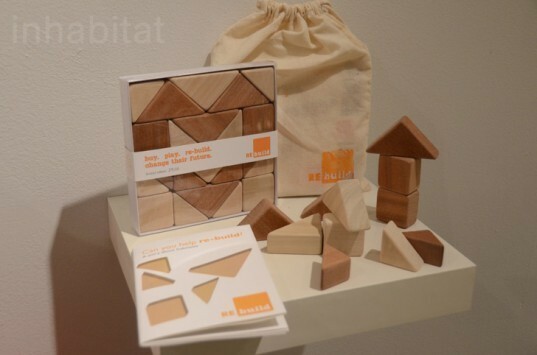 Designing Hope's Rebuild Blocks are limited-edition toys created with the Happy Hearts Fund to raise money for the construction of a kindergarten in Indonesia. Each block is handmade from reclaimed mahogany and poplar, and all proceeds from the sale of each set go to support the school. 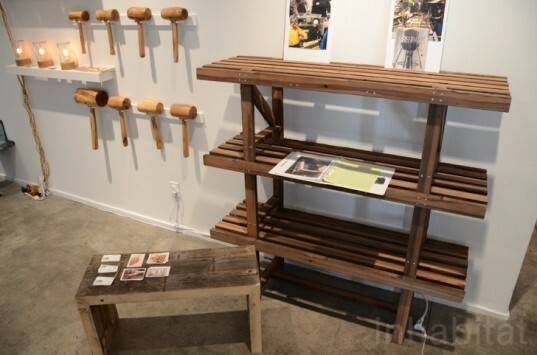 Blight Design transformed a naturally fallen Pennsylvania oak tree into a series of turned wooden mallets for his friends who are chefs. 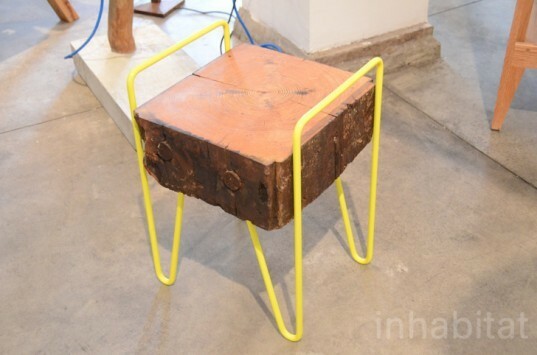 Reclaiming Brooklyn also exhibited a stool made from salvaged wood that pops atop a brightly-collored metal frame. Inhabitat favorite EcoSystems unveiled a massive wood tower made from snug-it connectors that stretched the entire height of the show floor! 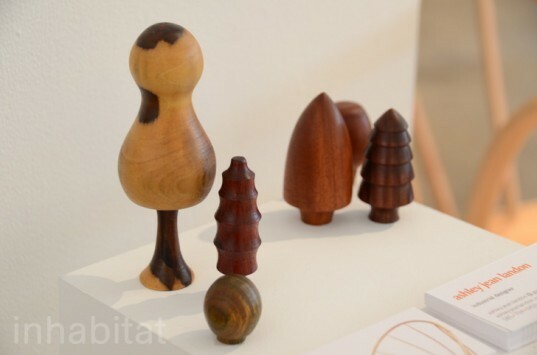 Ashley Jean Landon salvages off-cuts from wood shops and transforms them into miniature trees! Her Reforestation "forest" is a response to the tremendous amount of waste in the lumber industry. Piey Design showcased a set of brilliantly hued "Pireuta" tables, which feature striped designs reminiscent of wooden toys made by Mexican artisans.